The vessel was inspired by Ocean voyager trademark: reliability, safety, simplicity and design innovation. The conversion hull was carefully chosen for its superb workmanship and its weight displacement. 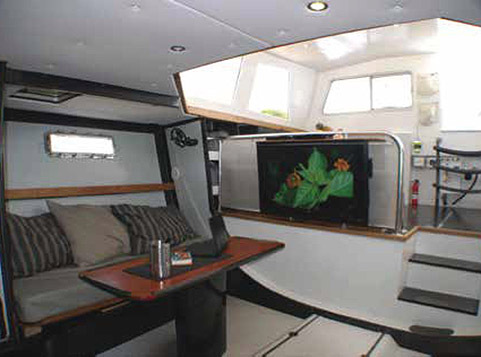 The hull was built flawlessly by New England Boat Works to a Bill Langen design. Constructed in all carbon and epoxy and Nomex core, vacuumed and baked to exacting specifications. The original hull was chosen for its performance upwind, strength, long waterline and seaworthiness. voyager redesigned the layout, draft and power configuration as well as stability performance under the most challenging conditions. Under sea trials and long distance cruising the boat proved itself to be our best and fastest cruising trawler. A vessel with a fine entry for upwind condition and long waterline for speed. To do this the vessel must be light, with an upwind design configuration and Acharne, at 20 ton fully loaded compares to the weight of some 40′ sailboats. A vessel able to be operated ONLY by two people without any crew; requiring low, low maintenance on very simple mechanical systems which are easily accessible. The vessel must have the lowest carbon foot print and fuel-consumption possible for an ocean-going powerboat capable of long passages. 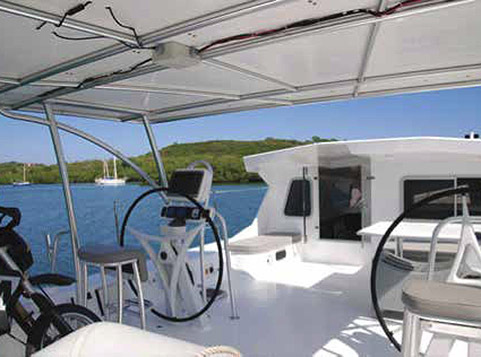 An immense back deck, with comfortable outside accommodation, water access for diving, easy dinghy retrieval and storage on deck, and easy access to the dive compressor and dive gear. Green, by installing very large solar panel arrays, we have achieved a zero-diesel charging electrical system at anchor with limited daylight air conditioning operated by solar. Stability. A vessel which can sustain heavy weather with minimum challenge. This was achieved with low displacement, inherent stability from low deck and cabin weight plus inside and outside ballast. Keeping the boat light with low profile was a priority. Speed. We wanted to go against the weather comfortably at 9 to 10 knots and go downwind at 12 knots or more. “Acharne” surfs beautifully downwind with little or no yawing or pitching common to shorter waterline trawlers.